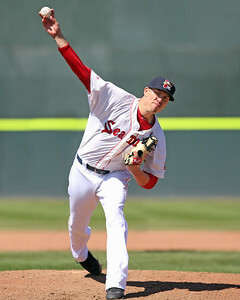 Hernandez had a breakout season in his first with the Red Sox organization. The 23-year-old shortstop was acquired as the player to be named later in the deal that sent Felix Doubront to the Chicago Cubs in August 2014. Like Light, Hernandez began the season with Portland, where he hit .326/.349/.482. That line was capped with a 13-game hitting streak immediately before his promotion in July. Hernandez's .305 batting average for the season was his best since hitting .333 as an 18-year old in the rookie-level Arizona League in 2011. The addition of Jerez was not one that seemed likely a couple years ago. The 2011 second-round pick had bottomed out during the 2013 season with Lowell--as an outfielder. After hitting .176/203/.235 with the Spinners, Jerez resurrected his career by making the move to the pitchers mound. After getting acclimated to pitching in 2014, the 23-year-old was excellent across three levels this year. In 41 appearances between Greenville, Salem, and Portland, Jerez posted a 2.54 ERA, striking out 86 and walking 31 in 88 2/3 innings.